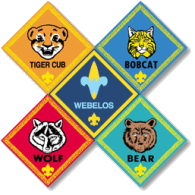 In order to earn their badge, all Wolves, Bears and Webelos must camp overnight. In addition to our annual trip to Cubworld in July, we have two other trips, at a minimum, which allow scouts to meet this requirement. The first of these trips is our fall overnighter which will take place in October at Pouch Camp on Manor Road. This is a great opportunity for all first time campers. You can camp in the conveniently located Maple Cabin or bring your own tent. Our second trip is also at Pouch camp in June. If you are unable to camp, you are still encouraged to come to the Moving UP BBQ on the Saturday of the trip, where our scouts will move up in rank. All campers must have parts A & B of the medical form completed. Part C and the pages after are not necessary for Family Camping. The medical form is located below.